A full-wave rectifier circuit is a circuit that rectifies the entire cycle of the AC sine-wave. A basic full-wave rectifier uses two diodes. The action of these diodes during each half cycle is shown in Figure 7. 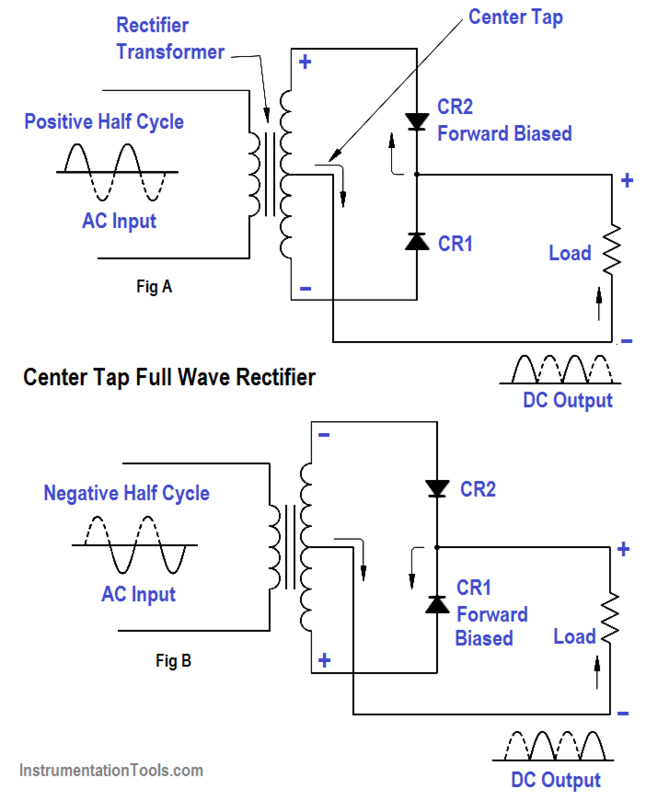 Another type of full-wave rectifier circuit is the full-wave bridge rectifier. This circuit utilizes four diodes. These diodes’ actions during each half cycle of the applied AC input voltage are shown in Figure 8. The output of this circuit then becomes a pulsating DC, with all of the waves of the input AC being transferred. The output looks identical to that obtained from a full-wave rectifier (Figure 7).